I've had some time lately to do a little work on my bike, seeing as how I'm not riding it. In the process I ended up having some black background vinyl left. The boys were quick to find a use for it. As you can see we had enough to cover the rear number plates of both 110's. We couldn't really leave it plain and the boys didn't like the idea of putting numbers on so they chose to go with a couple stickers from our local hobby lobby and full throttle. Of course we cleaned them up in the process, dug the dirt out of Owen's throttle again and put some hard plastic ends on the bars to keep them from poking through the grips in a fall. 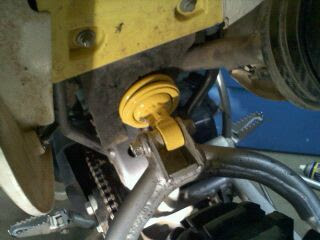 We finished up Brayden's bearings on the rear wheel and in the process I noticed that the rear shock needed some work. At first I wasn't sure if the shock could be rebuilt, but found that it was partially serviceable. It doesn't appear that anything can be done with the nitrogen bladder, but the seals are replaceable and the oil can be changed very easily. To see the process look here at how I rebuilt the rear shock on my Honda. The process of getting into the shock and changing the oil is almost identical. Basically you just have to pop of the dust cover with a hammer, push down the seal head and remove the inner snap ring to let all the insides come out. I ended up just replacing an o-ring on the seal head and changing the oil. The oil level was down about an inch greatly affecting it's dampening abilities. I also decided to see about raising the rear a bit since it's always seemed low, but also because Brayd is ready for it to be a bit taller. To achieve this there are actually complete shocks that are a half inch longer that can be bought, but they are most often for heavier riders and more than I want to spend. For now, I just added about 3/4" to the shock by welding a tubing spacer between the eyelet and the shock as can be seen here. The height is almost identical to our TTR 110 now, and the shock works killer and is super smooth. It doesn't add any travel, but for Brayden's weight and abilities it seems to work really well. Thanks! 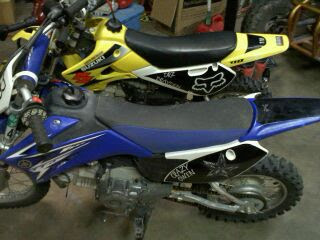 They are itching to ride!